The new addictions course that is available on-line this week at PAHA is part of our DSM-IV TR for the Addictions Professional Series: “Anxiety Disorders, Trauma and Disorders of Extreme Stress”. 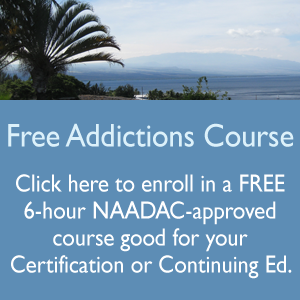 This is a 6-hour course that is also available at our on-line training center anytime at http://substanceabusecounselortraining.com which covers the topic of anxiety disorders, trauma and disorders of extreme stress with a specific substance abuse focus for Nurses, Counselors, and other Health Professionals. Working at the homeless shelter in town, the people we help have all experienced some level of trauma. Getting a clearer picture of how and why some behave the way they do has been very enlightening for me. It can be very frustrating at times, people come in, have a hard time adapting to the rules of the program, the manditory classes and appts, the high standards of cleanliness, and high expectations that we have to uphold as part of our job. Plus, our program is only a six week program. Understanding that people are still dealing with the effects of their tramatic experiences is really important when working there. Just because they now have a temporary roof over their head or a short break in time from a toxic relationship, doesn’t mean that they are going to be easier to work with. Some get easily aggitated, confrontational, or emotional over things that may not have bothered them when their lives were less traumatic. How can we even begin to judge these people? We can’t. I am a very compassionate person but if life circumstances lead me to losing everything I had, who’s to say what kind of person I’d be. So important to be open, patient and humble. In this section of our module I have found that everyday.Living is very stressfull, on everyone and that relationships are even more stressfull with alot of anxieties and trauma. In relationships where one person has a normal routine like going to work.And the other person is home tending to the home,the person at home is filled with hopelessness.And feels there is nothing that they are doing to contribute in paying the bills and doing something worthwhile. What sets in is panic,anxiety,and fear they hide behind cigarettes and alcohol get into situations that they would normally not do,if they were doing something worthwhile.How would you set out to help some in this kind of situation?